﻿ Vinh Trung Plaza Apartments and Hotel, Da Nang | FROM $25 - SAVE ON AGODA! 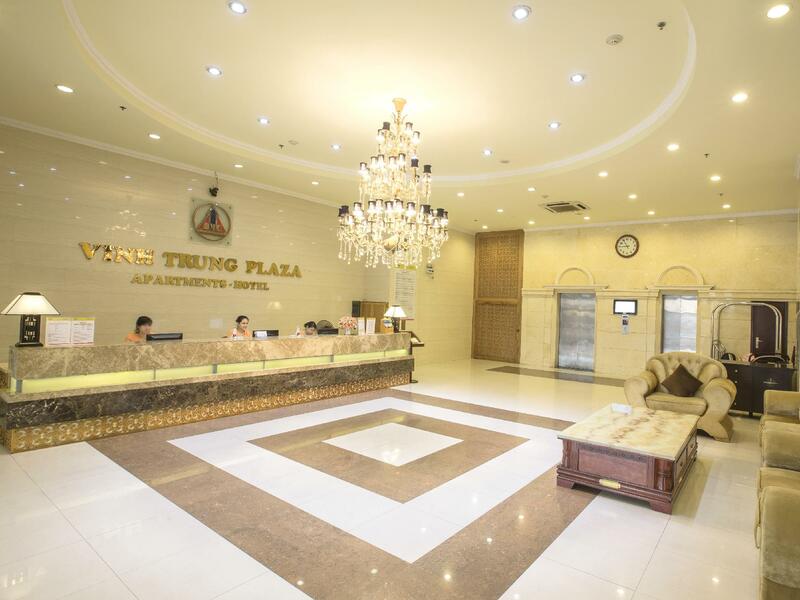 "Good enough for stay with family, safe money"
Have a question for Vinh Trung Plaza Apartments and Hotel? "Location is perfect next to shopping mall." "Big bed , clean, wide living room." "Good location at city center." Known to be the biggest, most modern commercial center is this apartment and hotel. 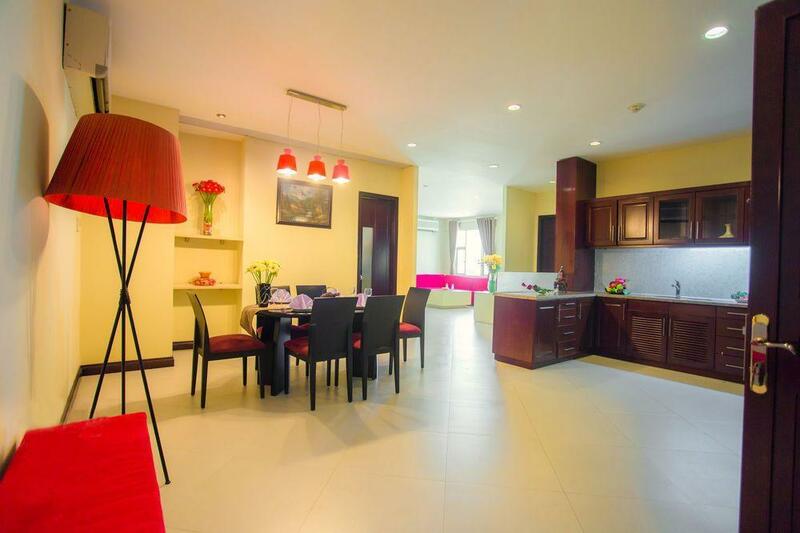 Vinh Trung Plaza Apartments and Hotel is located in the heart of Da Nang, just 1km from Da Nang Airport and 3km from My Khe Beach. This plaza consists of office towers, a luxurious apartment tower, luxurious hotel, and a recreational zone. This hotel is designed with a combination of French architecture with modern Vietnamese culture. Each of the 104 rooms in this hotel is fully equipped with all the basic amenities and facilities with a separate living room. Guests have a choice of different types of rooms depending on their preference. This plaza is surrounded by restaurants, hotels, entertainment services, and fashion stores for guests to enjoy. 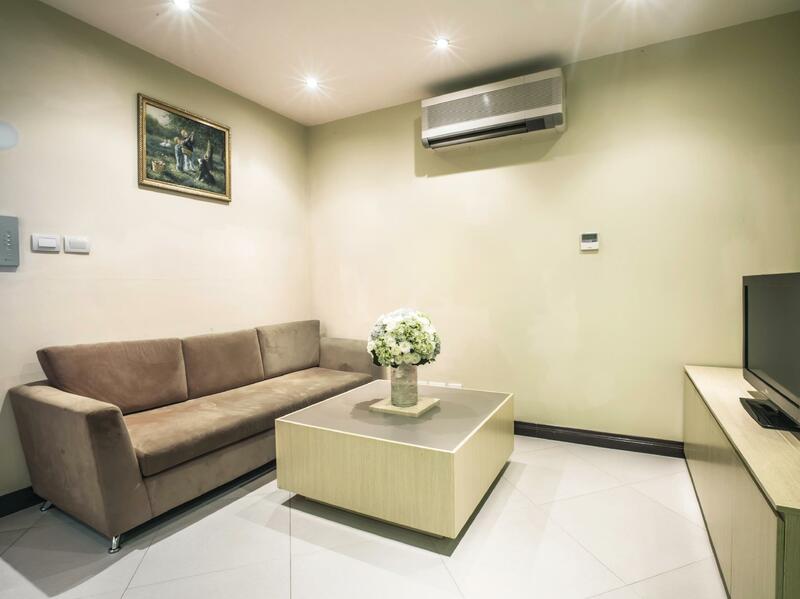 Guests will enjoy being in the heart of the city and will enjoy the comforts of Vinh Trung Plaza Apartments and Hotel. "Spacious, good value for money"
Good location at city center. BIG C downstairs. Easy to find taxi as many parked outside of BIG C. Only problem is the water heater for shower. It's too small volume so that you can take short shower only. Even not enough for hair washing. The location of the hotel was good, as it was surrounded by shopping and dining options. The free breakfast was also good, with a good range of food which changed slightly daily. The staff was helpful in answering our queries. However, we found 3 cockroaches in our room. Also, the tour packages provided by the hotel were extremely over priced. We paid 800,000 VND for the My Son tour, and found out that other tourists only paid about 150,000 - 180,000 VND for the same thing. Hence, it is advisable to get your tour packages from elsewhere. I stayed very comfortably in this hotel with my 5 y.o. grand son. 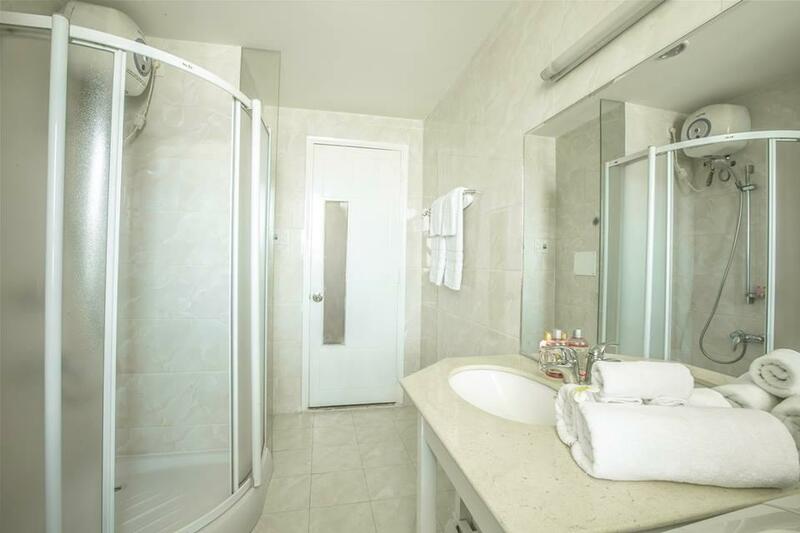 Great location with a bustling commercial street nearby and the modern Big C department store under the hotel. The staff very nice, polite and helpful. The manager approached e almost everyday to ask me whether everything was alright. We really enjoyed our stay at this hotel. It was very spacious that allowed us to have areas to read eat and sleep all in different areas as opposed to the one-room hotel stays. It was conveniently placed within a mall with a supermarket for food and household items. There was also a movie theater in the same building. The lamp was broken, we informed the hotel on the first minute arrives since we did not want any troubles. Till the last day, things were the same. Plus, the internet was terrible, it was either very weak signal or lost. Finally, the 1 bed room we stayed was not look like any of these above photos. Poor service. Poor rooms, poor beds. Poor breakfast. Everything are under standard. Would not recommend this hotel to any who will visit Danang in the future. The only best thing is the Big C super mart under the hotel. I'm happy to spend time here with my beloved. Staffs are super nice, room is clean and cosy. I have nothing to complain about. This is a great place to stay when you want to be in a place just like home at a very reasonable price. Highly recommend! There is nothing good to say about this place - it is definitely not 4 star!! The apartment was a reasonable size, but the aircon was too loud to operate, the walks covered in mold, the apartment full if ants and Mosquitos. There was no crockery or cooking equipment and the bed springs were protruding. We didn't stay for breakfast, just couldn't wait to get out of there! There were some issues when we checked in as the hotel did not have the booking details from Agoda, but fortunately we had our printed hotel voucher. All the 2 bedroom apartments were taken so we were given a 3 bedroom apartment for the night. The hotel staff were very helpful and friendly. The apartment was very spacious and a good place to rest, with an extensive view of the city. The hot water took some fiddling but eventually worked. The hotel staff were very cheerful, friendly and helpful. The breakfast was good and had several different dishes. The apartment had a very spacious living area and a good view over the city. The apartment also had cooking facilities. It was a good place to relax. The apartment was right next to a large shopping centre so there were people coming and going nearby. Only pros is the big room, water was cold, breakfast was the worst i ever had. Staff are not friendly especially the security guards and bell boy was the worst i ever seen. No tv in room only in the living room. We enjoyed our stay immensely. The staff were very attentive and always ready to assist. The breakfast menu needs to reviewed. The menu says ham sandwich and you get a fried egg with slices of park and salad , it also has an omelete mentioned but you get two fried eggs with salad. Travel to marble mountain and Monkey Mountain a must. Lots of History to see and learn. Take a trip across the Pass and see the Magnificent views and learn more history. And if you're a motorbike enthusiast, don't let anyone stop you from hiring a bike and riding yourself across the Pass. It's amazing and the best way to experience. Most cars and trucks take the tunnel, so although the locals may say its dangerous, it's really not, if you're bike savvy. Locals on the pass a so friendly and love Aussies. Ask the front counter at Vinh Trung to arrange the hire of the bike. Be sure to also ride around Danang don't miss those little side streets and old villages. The kids and people love to come out and say Hi. We loved this place,we only stay in apt side but still,the staff was very helpful and serve you as soon as they could,the place is new so there is no question about cleanness .The shopping mall is very easy for the rainy day or when you are in a lazy mood,with all the fastfood chain,shopping hairdresser,nail everything you need is there...We will definitely stay again for our next visit. Big not bad apartment wiht furniture, but wadhing machine with missing water hose,kitchen without culturings ang cocking pots ,but if you don't care about it it is OK.Also no restautants in this area, must walko about 10-15 min to closest one. I think the kitchen facilities should be included in the price for customer convenience. We would be happy even have to pay at higher rate. This is the 1st service apartment we stayed with an empty kitchen and not enough light. However, this is good value for money. Very good location and friendly staff.